Prime Minister Datuk Seri Abdullah Badawi will not defend the Umno presidency. He told leaders of the Barisan Nasional (BN) component parties here today that he will quit as party president by March next year. This will pave the way for Datuk Seri Najib Razak, who is favoured to win the party presidency, to take over as Prime Minister if BN remains in power then. “I will not stand for the presidency of Umno in the coming elections. My current term as Umno president ends in March next year,” he told reporters after the meeting. Bringing the curtains down on over 45 years of civil service and governance, he said that his decision was to make sure there would be no split in either Umno or BN. “I have always been guided by my conscience. I do not want a divided party and governing coalition but one that is united. This is not the time for infighting,” he explained. He reiterated that between now and March, he would continue to push his reform platform. Abdullah promised to table in Parliament legislation for the formation of a Judicial Appointment Commission and an anti-corruption body modelled after Hong Kong’s Independent Commission Against Corruption (ICAC).The prime minister said he hoped to hand over the reins to his deputy Datuk Seri Najib Razak. “I say hope because he is standing for election as president of Umno first. I believe he can win,” he said, adding that the hand-over of the premiership would be discussed after Najib was elected as his successor by Umno. 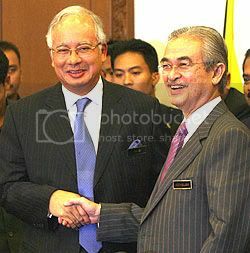 According to Abdullah, the supreme council had accepted Najib as the designated successor. He however, admitted that he had not done well enough in the March 8 general elections, where BN lost its two-thirds majority in Parliament and ceded five state governments to the opposition. “I do not regret what I’ve done. How the people act and respond to that is up to them to decide,” he replied when asked if he was sorry that he had opened up and liberalised the country. PM And DPM Are Away, Who’s In Charge?